The Edge is and always has been a handsome SUV. For 2019, Ford created a new front end that adds some definition and detail to last year’s more slick and featureless face. It’s an improvement, but still completely recognizable as the Edge it’s always been. For better or worse, the Edge is not the butchest-looking SUV. I appreciate that. It isn’t made to go off-road, and it doesn’t pretend otherwise with details designed to mislead such as fender flares, faux skid plates, and excessive body classing. Rather, it looks clean, mature, and more sophisticated than something’s that’s trail-rated to climb a mountain. If you’ve ever sat in a Ford Fusion, you’ve essentially sat in the Edge. I drove a Fusion immediately preceding my time with the Edge and was surprised to find an almost-identical dashboard, center console, switchgear, and materials in both. Is that worthy of demerits? Not necessarily, as the cabin and its controls are well designed and straightforward to use. Like the exterior, it’s all handsome in appearance and performs well with no ergonomic bugaboos. In terms of comfort, because there’s no third row in the back of the Edge, space abounds for both people and cargo. If you do value every inch of elbow-, head-, and legroom, then know there is more of it here than in the smaller Escape. Overall, the Edge offers 113.9 cubic feet of interior space to the Escape’s 98.7.1 sat in every seat of the Edge, and there isn’t one among them that feels tight or encroached upon. height, width & depth, and for most of life’s detritus. ForcTs technology and connectivity features have been well established as above average but not industry-leading. They are, however, continuing to head in the right direction with this year’s refresh of the Edge. Front and center is the latest version of Ford’s Sync 3 infotainment system, which comes with navigation standard in the Titanium trim level. Its user interface is dead simple to use, though its blue-and-white color scheme is eminently bland. My biggest gripe with Sync 3 is speed; Ford needs to bump up the processor’s specs so inputs are reflected on-screen in real time. Backing up the infotainment system are a few special features that Edge owners will surely like. Wireless charging is one, which allows specially equipped smartphones (most these days) to charge their batteries without plugging into a USB port. The second is FordPass Connect 4G Wi-Fi, which broadcasts a fast Wi-Fi network within the SUV for everyone to join and surf (though it comes with a monthly subscription cost). Being the Titanium trim level, this Edge also came with many other conveniences, such as the aforementioned hands-free, foot-activated tailgate; heated front and rear seats; cooled front seats; and Ford’s premium Bang and Olufsen sound system. The main available mill is a turbocharged 2.0-liter four-cylinder EcoBoost engine. While its cylinders are few, its power is impressive. Horsepower tops out at 250 while torque reaches a maximum of 280 pound-feet at a usefully low 3,000 RPM. Compare that to the Nissan Murano, which offers a 3.5-liter V6 that produces 260 hp and 240 Ib-ft of torque. The Edge’s engine, despite its smaller size, can even tow more than the Murano: 3,500 pounds max to the Nissan’s 1,500 pounds. In terms of driving, the suspension’s default state is well-balanced between a comfortable ride and controlled handling. No matter how nimble the suspension feels, though, the Edge made me a little nervous to drive fast because its outermost corners can be difficult to place. The A-pillars are massive, while the hood is high-off the ground and remains so out to the front corners. It makes knowing exactly where the Edge’s leading… umm. edge… is difficult. If you want a sporty Edge don’t look for the Edge Sport – Ford replaced it with the Edge ST, which features the Sport’s powerful, twin-turbocharged 2.7-liter V6 engine and vastly improved suspension. The standard Edge trim levels, though, should be dynamic enough for most. Ford has joined other automakers such as Honda and Toyota in offering a full suite of advanced safety features as standard equipment on some of its models. 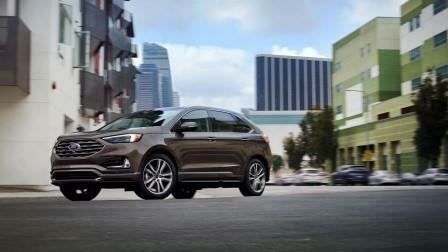 Called Ford Co-Pilot 360, its first appearance in Ford:s lineup comes on the 2019 Edge. Co-Pilot 360 comes standard on all Edge trims and features a blind-spot-warning system with rear- cross-traffic alert a lane-keep assist system, automatic emergency braking; and automatic high beams. It’s a full-featured suite of active and passive safety features that Ford offers standard. Other advanced safety features are also available as options and include adaptive cruise control with stop-and-go and lane-centering technology, evasive steering assist, and post-collision braking. Those are all nice to have, but the standard collection of safety tech in Co-Pilot 360 is more than enough to improve your chances dramatically of avoiding an accident altogether. Despite running with two fewer cylinders than most of its V6-powered competition, the Edge isn’t appreciably more fuel efficient. The Environmental Protection Agency rates the Edge at 21 miles per gallon in the city, 28 on the highway, and 23 combined The Murano, for instance, manages a bit better at 24 mpg combined. It is impressive, though,, that the Edge is more fuel efficient (one mpg better in both city and highway driving) than the smaller Ford Escape, which uses a very similar engine and weighs considerably less. And regular fuel is just fine for the Edge; no high-priced premium gas required. As popular as SUVs are these days, not all are selling like crazy. There are some SUVs that sell just okay. I’m talking about mid-size SUVs: such as the Nissan Murano, GMC Acadia: and this one, the 2019 Ford Edge. 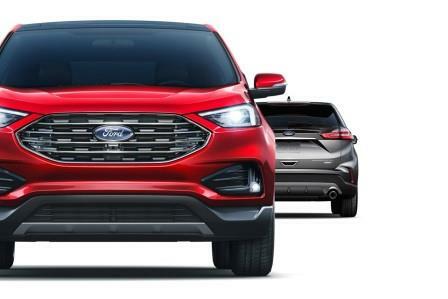 Living with The edge: Like its mid-sized competition, the Edge slots in Ford’s SUV lineup between the smaller Escape and the larger Explorer. In terms of popularity, it’s no slouch, selling around 10,000 examples per month. 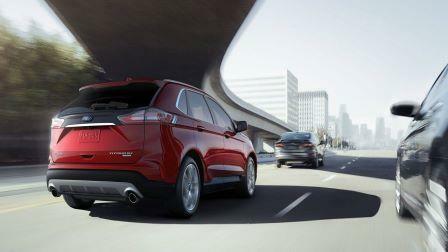 But the less costly Escape and more expensive Explorer each sell around twice as much as the Edge. Why the disparity? The reason might be that mid-size SUVs are the ultimate wingman on dealer lots. If you’re looking at an Edge and concerned about price, here, meet its friend, the Escape, that costs less and is only marginally smaller. Concerned the Edge won’t fit your growing family in a few years? I’d like to introduce you to Explorer, which has three rows of seating and costs just a bit more. But the Edge has been refreshed for 2019 with a new look and lots of advanced safety features. It makes a better case for not being passed over than it ever has before. The question is, will you go home with one? Compared to other mid-size SUVs, the new Edge has a relatively low starting price of $29,995; both the Murano and Acadia start over $32K. That said; this Titanium tester has a much higher base price of $38,550. With all-wheel drive and a few additional option packages, its as-tested price comes to $47,775. A similarly optioned Ford Escape Titanium, meanwhile, tops out at S37,865 – about $10K less. See how easy it is to sell the Escape when the Edge is around?